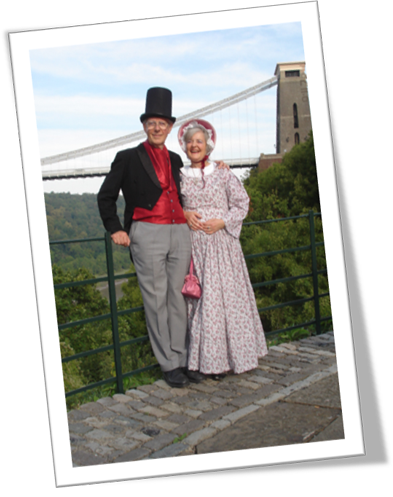 Teresa Gale is a tailor and dressmaker based in Bristol, specialising in authentic historical costumes. Her training has included a master tailoring course with Marilyn Mann, a pattern making course with Margot Arendse (who was a designer of Marks and Spencer’s underwear) and a toile cutting course at Salisbury College of Fashion. She has made costumes for many local well known companies and also for professional actresses such as Prunella Scales. Costumes can be bespoke or you can hire them. Costumes in stock range over many historical periods and also in larger sizes. The correct underwear such as corsets and crinolines can also be hired. The photos on this website are a few costumes representing the wide range of costumes which can be hired, some are taken at events or in the theatre, but should give an idea of the details and range of clothes for both men and women it has been my pleasure to make.